I wake up with a to do list. Not necessarily written out on paper, but I have one – it’s imaginary…. ah, in so many ways. Imaginary because I don’t ever write it down so… it’s not really a list… But more so imaginary because I actually have the naiveté every morning to actually think I’m going to get it all done (& yes, I did just say actually twice). Maybe I have too high of standards. I have this long list of every thing I will accomplish and I fight to feel like I succeeded — to feel like at the end of the day, I won. But really, I rarely ‘win’. Life happens… every day. Now that’s not to say that I’m not productive. Before I go to bed I will have put together 190 magnets for the reward boards I’m selling on etsy. I also re-organized one of my craft boxes, unloaded and loaded the dishwasher (do I even need to say that one, lol), processed 2 loads of laundry, washed 4. Made beds, cleaned up, fed my kids, made dinner, played, worked on photoshop, and I could list more boring stuff but hey, not even I care that much. Bottom line, I will all but my dining room table go to bed with a tidy house. So today I was fighting with my baby to take a nap. I worked for 45 minutes, soley devoted to getting her to sleep on my bed so I could do something with both hands and guess how long she slept? 3 minutes. Yep. What a waste. So I went along with my day, holding her while I made beds, holding her while picking up and getting H a snack and so on, putting loads in the washer/dryer… hanging them up… and couldn’t help but feel frustrated. I even tried her for a nap a second time, which turned to be pointless as well. My dining room table is still a disaster (not as bad but… still) and my obsessive side is making BIG complaints to me. I can’t help but remind myself the thing I remind myself over and over and over again: this is NOT what is important. Of course, I don’t believe we should live in filth, and quite honestly I have a need to live in a clean household, it’s where I feel peace. But I don’t think that being a freak about my house needing to be 100% in order is healthy. It shouldn’t stress me out. It shouldn’t make me grumpy. It’s really NOT what is important. Holding my baby who just really wants her mommy — that’s important. That’s the thing I will look back on and miss. I’ve said this 1,000 times but I have to say it to myself daily: I am not going to regret my house being a mess, I’m not going to yearn for one more moment sitting in my *clean* house in my little corner of the world. I will wish I could hold E, or H, or K one more time. I will miss E’s snuggles, H pulling at me saying “Mom… you betta play…. you betta play….” I will miss K begging me to do more homework with her. *sigh* Yes, I will miss these things. 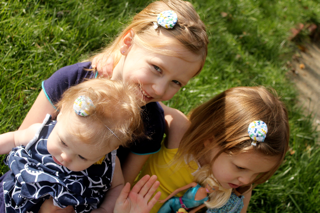 here are some pictures of my girls wearing their clips/headbands made with an old t shirt of H’s that got stained. Cute right? And so easy! See tutorial here. 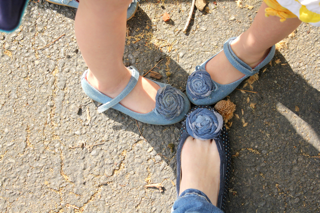 & here are our shoes. I had some jeans that got holes in the knees so I made myself cut off shorts, the girls clips/headbands, and these for our shoes. So fun. you are a fun mom. and a good mom. 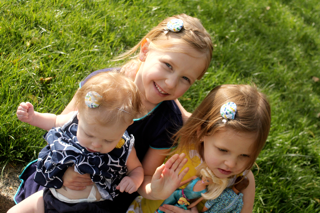 and i agree… really at the end of the day we will be thankful for the time we spent with our babies. even the 45 minutes weren’t a waste because YOU were the one cuddling her and spending time with her trying to get her to sleep. i tell myself that when i rock simeon for an hour sometimes trying to get him to sleep: i will miss these times rocking a sleep resistant baby. i love your shoes. love them. your so creative and your words are so true! Previous post: My baby is crying, it’s true.